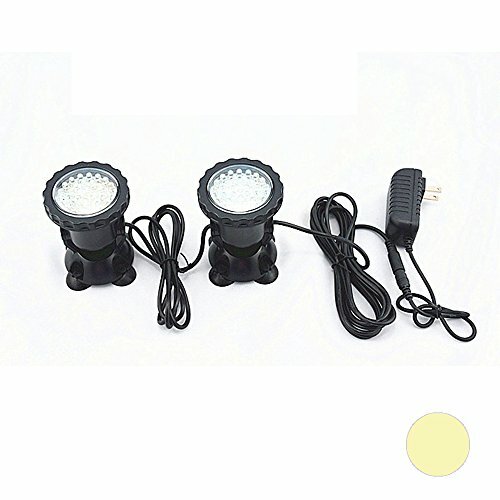 Spotlight,COOSO Waterproof 36 LED Submersible Spotlight Landscape Lamp for Aquarium Fish Tank, Garden Fountain, Pond Pool,Set of 2 light Yellow | Fountain City Art Ctr. The COOSO waterproof Submersible Spotlight made for Aquarium Fish Tank, Garden Fountain, Pond Pool, Fully submersible and perfectly sealed spotlight, adds a dazzle of color to your aquarium, pond or fish tank. Please look the "OSO"brand£¬we provide one year warranty. Full Adjustable 180 degree joint stand lets you point the light at different angles. Shell is made of high quality engineering Environmental protection plastic ABS.